Rotation is a way for the skier to turn the skis with upper body movements. Here, Anne demonstrates one turn using edge angle and ski shape, and another using upper body twisting. 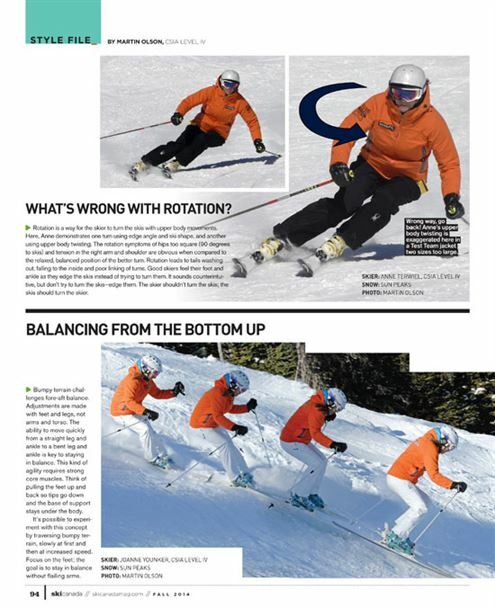 The rotation symptoms of hips too square (90 degrees to skis) and tension in the right arm and shoulder are obvious when compared to the relaxed, balanced position of the better turn. Rotation leads to tails washing out, falling to the inside and poor linking of turns. Good skiers feel their foot and ankle as they edge the skis instead of trying to turn them. It sounds counterintuitive, but don’t try to turn the skis—edge them. The skier shouldn’t turn the skis; the skis should turn the skier. Wrong way, go back! Anne’s upper body twisting is exaggerated here in a Test Team jacket two sizes too large. Bumpy terrain challenges fore-aft balance. Adjustments are made with feet and legs, not arms and torso. The ability to move quickly from a straight leg and ankle to a bent leg and ankle is key to staying in balance. This kind of agility requires strong core muscles. Think of pulling the feet up and back so tips go down and the base of support stays under the body. It’s possible to experiment with this concept by traversing bumpy terrain, slowly at first and then at increased speed. Focus on the feet; the goal is to stay in balance without flailing arms.